It is cold, but that is where the magic happens! You will be in the cryochamber for a maximum of 3 minutes and temperatures are able to reach below to -240F, which is safe and does not allow your body to reach hypothermia. The majority of your body will be exposed while in the chamber in order the reap the benefits of the cool air. You will only be wearing socks, slippers, and gloves to cover the most sensitive areas of your body. Women will wear their bra and underwear, men will also wear briefs. We will provide you with the gloves, slippers, and robe to use. You should not apply lotion or any moisture to your skin an hour before your session. All jewelry should be removed below the neck. 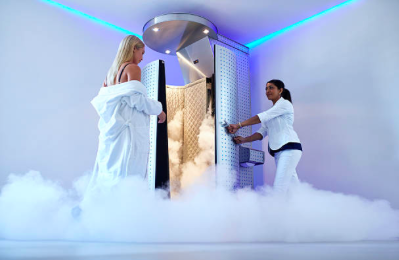 The first appointment may take 15-20 minutes to make sure that you are fully educated to the benefits of cryotherapy and to familiarize you with the process at CRYOFitNC. Our employees are all certified Cryotherapy technicians who are able to answer any questions that you may have. All customers must also sign a waiver that we will keep on file for your subsequent visits. Most appointments will last 5-7 minutes after the first appointment. JUST 3 MINUTES IN THE CHILL AND YOU WILL …..